Wear Yellow Nebraska's purpose from the very beginning was to bring people passionate about cycling together to celebrate life and fight cancer. To sustain our mission, we network with local donors, corporate sponsors, riders, walkers and runners, survivors, business partners, and volunteers to continue growing our events to fund our initiatives. As a cancer survivor, co-founder and past president Mike Buckley had the idea to start funding cab rides for cancer patients in Omaha who were without access to transportation, a need he discovered during his own treatment journey. Access to rides to and from treatment are essential because patients are in a weakened state and often times left unable to drive themselves, which also leaves them vulnerable to lapses in vital medical care. Even if patients do have family and friends who can help, they aren’t always available. The annual Wear Yellow Ride turned into a way to fund vital transportation by providing free cab rides to cancer patients in need, and the cab rides remain our primary program to date. A Ride for a Ride. Since launching our free cab ride program in 2012, Wear Yellow Nebraska has funded more than $124,000 dollars providing more than 7,500 cab rides to Nebraska cancer patients in need. 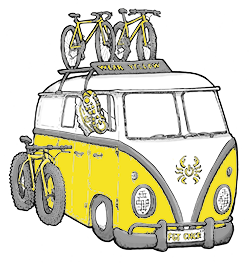 In addition to our signature event, the Wear Yellow Ride, we organize smaller events throughout the rest of the year that help support cancer survivors in other ways. For example, we have offered financial aid to those in treatment to help offset costs and purchased iTunes gift cards for pediatric patients in hospitals that offer access to tablets so they can buy games and apps for entertainment. We’ve provided meal and gas cards for the parents of pediatric patients so that they can be closer to their children through treatment, and to treat themselves to a good meal once in a while. We provided luggage and a camera for a young cancer patient who won a trip to Disney World through Make A Wish, but she and her family did not have some of those simple things to make the trip a great memory. We want to help our Nebraska Cancer patients in meaningful ways. To provide service, support, and community for Nebraska's cancer survivors. Uniting Nebraskans in the fight against cancer. 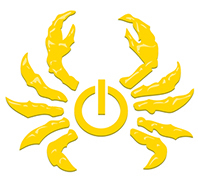 The Power Crab is a combination of two symbols. The symbol in the center of the crab is the universal sign for power. It signifies the "the power of you." The crab is inspired by the zodiac sign for cancer, also known as the cancer crab. Together they stand for the power of you, uniting in the fight against cancer. Do you have the power to make a difference?